Each and every step on our second staircase (the carpeted one!) was painted with “lion paw prints”, the same size as my four-year-old “cub” daughter’s hands. 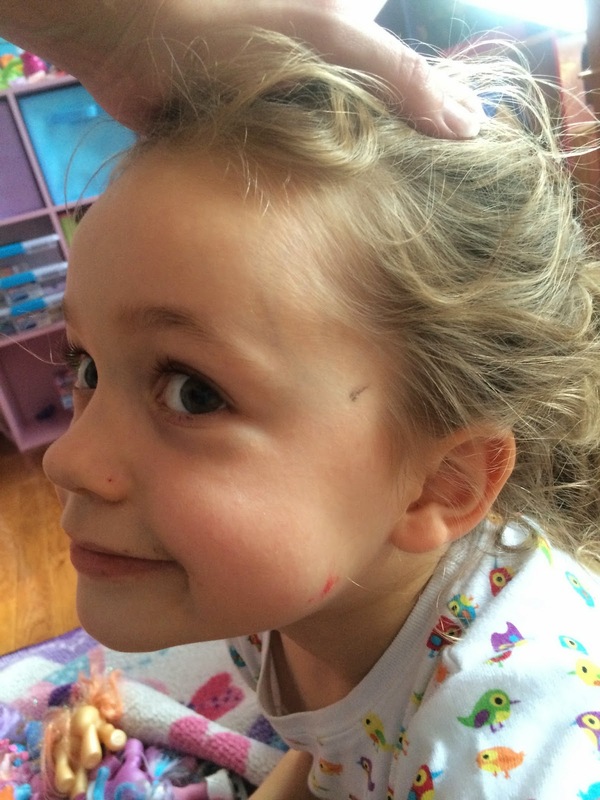 She’d been happily painting downstairs by herself, and it had only been for ten minutes! I’d just returned from my best friend, Heather’s, going away luncheon. I’d stayed up until two in the morning, writing her a special poem about our sixteen years of friendship and adventures. It had been worth it, and she had loved it. But now, I was tired, both physically and emotionally. I just wanted to relax for half an hour, sit on my bed, and rest my eyes. 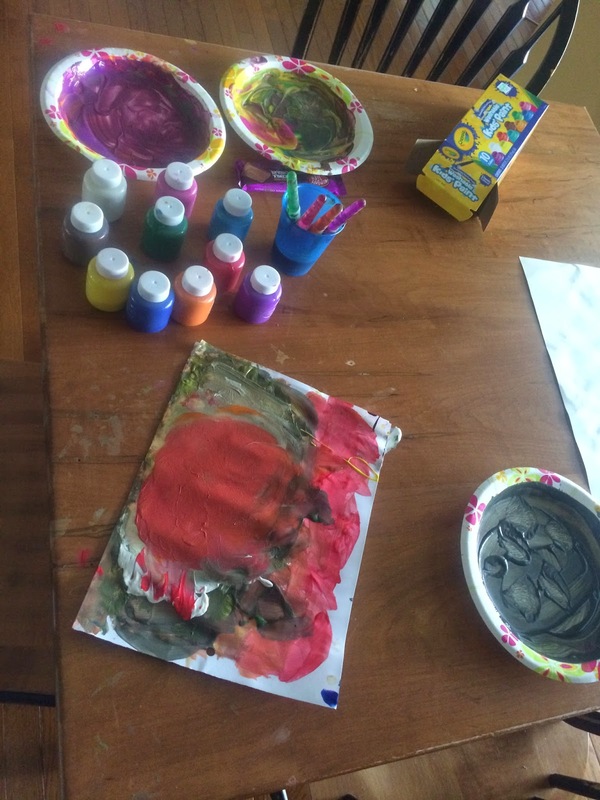 My daughter wanted to paint, so I put all the colors onto a paper plate for her, filled a water cup, and supplied her with paper and brushes. My teenagers had watched her for the day, and they also went upstairs, to complete their school work. I knew I wouldn’t sleep. In no time, Abigail came up to my room to ask me a question. Her hand was covered with paint. I offered to wash it off in the upstairs bathroom. “No thanks,” she said, politely. 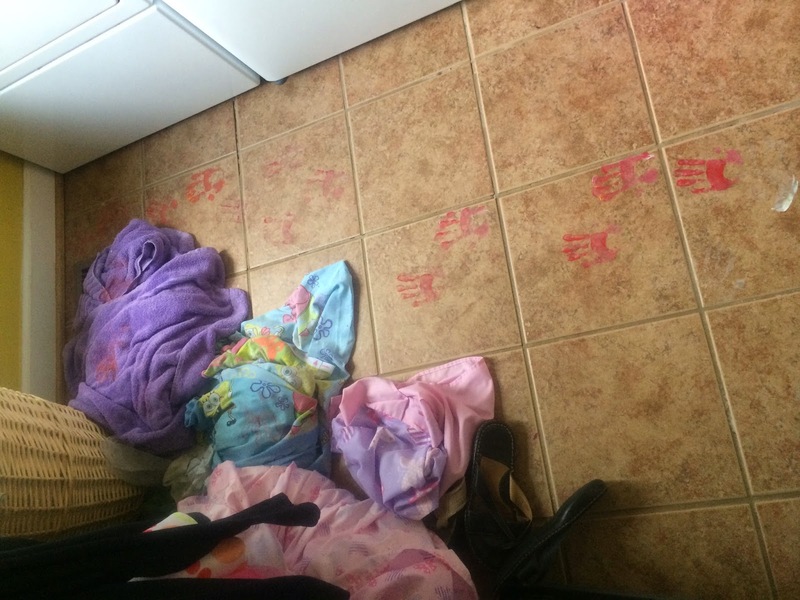 She was making paw prints with her hand, and wanted to make some more. She told me she would wash her hand downstairs, when she finished. Unfortunately, I agreed. 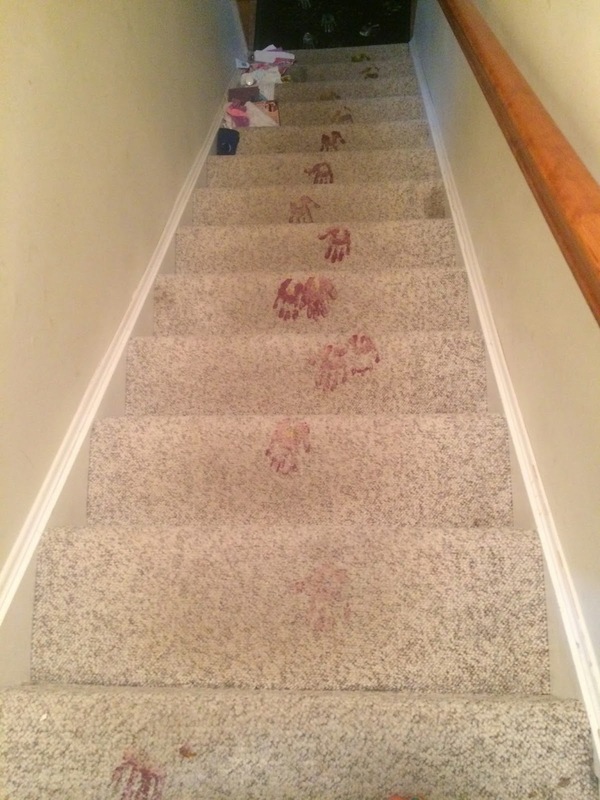 Minutes later, she came back upstairs, with paint all over both her hands. I asked her if she was done, and she said she was. As we went to the sink and started to scrub off the paint, wheels started to spin in my head. (Whew!) We have wood floors in the kitchen. Easy cleanup. I started for the hallway to check it out. I froze at the top of the stairs, and SHRIEEEEEKED! “OHMYGOSHWHATINTHEWORLD?” I stared, in disbelief, and called to my daughter to come from her room. I stood there, shocked, as my teenage boys, wide-eyed, tried to stifle their laughter. Somehow, somewhere, through all of it, I knew that it was true, that some day, I would laugh. But it only got worse, as I went downstairs. 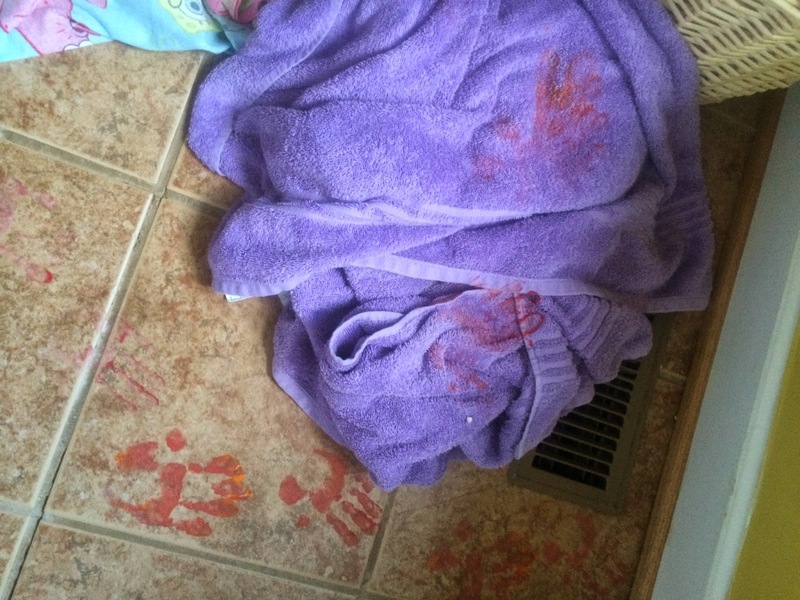 The lion “paw prints” made a trail from the table where she’d been painting, all along the wooden floor in the kitchen, on into the laundry room, and onto our new purple towels. Then they made an arc, and turned back around and made their way up the stairs. Nick had already found spray cleaner and paper towels. I added another cleaner along with old towels. My boys both sighed with relief when I told them the paint was washable. But that didn’t necessarily mean it was going to come out. Together we blotted, sprayed, and scrubbed. I told my daughter to sit at the top of the stairs in time out. Jake stayed with her to make sure she wouldn’t try to go back to her room to play. I thought about having her clean with us, but I didn’t want to deal with any more of a mess! 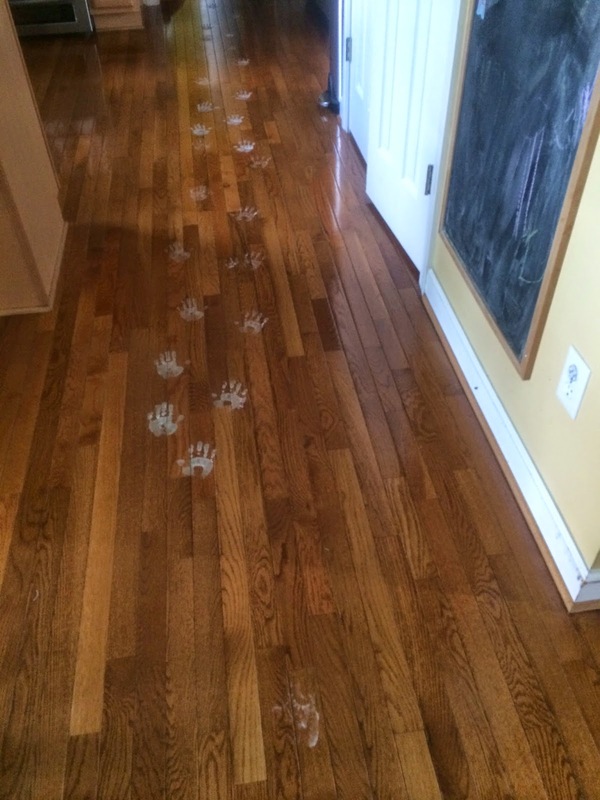 The lion paw prints cleaned up so well, that my husband walked in the door, just as we finished, looked at our stressed out faces, and said, “What? What’s going on?” As we told the story, he looked at the stairs in disbelief, and said, “Really?” Agggghhhh! I could say that the washable paint was a silver lining, but the silver lining was so much more. It lay in the truth of my thoughts, as I reflected upon how easy it was to forgive my daughter in her cuteness and sweet innocence. When I went into her room, where she sat on the floor singing (singing! ), I discussed with her what had happened. I told her why it was wrong, and what her consequence was. She simply smiled in her cheery way, and said, “I’m sorry!” When I hugged her and kissed her soft cheek, I could see a streak of paint next to her ear. In recognizing her childish innocence, I thought of how sweet it was, that she knew she was forgiven. She’d been given a consequence, yet she was joyful, because she was confident that her parents still loved her, and always will. As if that wasn’t enough of a precious gift, I realized that the silver lining of this day, was a reminder of God’s love and forgiveness for us, His children. Sometimes God must discipline his children, and there are consequences when we sin. Yet, God always forgives us when we say we’re sorry. He never withholds His love from us when we do wrong. Instead, He pulls us close, and He wraps us into His loving arms. He gives us a huge hug, and then He steers us back into the right direction. Because of Christ, we can hold up our heads confidently as we go to God, and we can remain joyful, and even, yes… sing! “Let us then approach God’s throne of grace with confidence, so that we may receive mercy and find grace to help us in our time of need” (Hebrews 4:16 NIV).